I put the mirror in front of Abbie and Sing the song “one little finger……., put it on you lips!” She is very excited. I also read the book with mirror to her and introduce the body part by using the mirror. Put the mirror in front of the baby to introduce the body part. Perhaps, you can sing the popular children song “Head & Should, Knee & Toe”. 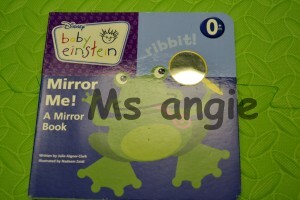 You can also using the flash card if you wish the baby explore the relevant words. This entry was posted in 6-9mths activities 6-9個月活動. Bookmark the permalink.